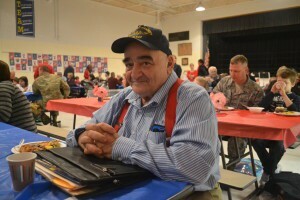 Shamong’s Indian Mills Elementary School celebrated local veterans and active duty members last Friday, Nov. 4 with a Veterans Day Breakfast. The breakfast was meant as a thank you to the local military service members as well as a way for the children to put faces to local veterans. “Every year we celebrate veterans with the students in some way… This year we wanted the kids to interact with veterans rather than just talk about (Veterans Day). It was a great way to see who the veterans really are in their community,” event co-coordinator and teacher Karen Clementi said. In past years, students have written letters to soldiers, sent cards and letters to veterans’ homes and had veterans speak before classes. This year, they wanted to do something unique for the annual celebration of Veterans Day with a personal touch. With these objectives in mind, the idea of a special breakfast was born. The breakfast was put together by the school, with teachers Kerry Haines and Clementi at the helm, in conjunction with the Shamong Township Education Association through its Project Pride Program. The program is an initiative that funds projects to promote the exceptional spirit and citizenship of the schools and students. The breakfast was set up buffet style with homemade breakfast foods, bought pastries and various refreshments. The hallways leading to the cafeteria and the cafeteria itself were lined with red, white and blue crafts and decorations created by the students and staff. Along with the breakfast was a projector featuring the students of the elementary school talking about the meaning of Veterans Day and what veterans mean to them. Students also handed out letters and pins for the military guests to take home. 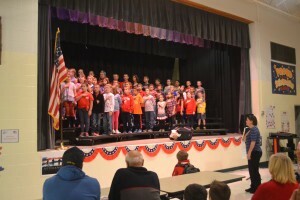 The breakfast culminated with two songs performed by the third- and fourth-grade students. “It’s very nice that they are giving back to current service members and veterans,” Air Force Master Sgt. Chris Crosbie said. “I think it is great. It shows a lot of camaraderie in the community and respect for our veterans and appreciation for all of their service, past and present,” Board of Education member and Gulf War Marines veteran Jeff Warner said. “It was nice to honor (the veterans). This is only a small token of what we can give to them for what they gave for us,” Haines said. 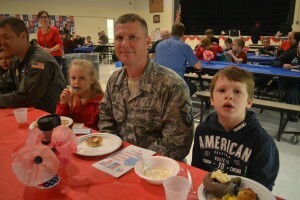 Clementi and Haines thought the breakfast was a great idea, not only to thank the community’s past and present military members, but also to teach the children. They both would like the children to take away appreciation for veterans and their sacrifice for the country, and to realize a military career is an option with many career choices. “I’m very proud of the kids who came and helped out. They were very respectful… I hope that they are more aware of who veterans are,” Clementi said. The veterans in attendance agreed the day was great, and thought the school should do it again next year. Another veteran in attendance was longtime Shamong resident Sam Duffy, first class in the Navy Submarine Service. The Sun had a chance to sit down with Duffy and learn more about his service and background. Duffy grew up in New York and was drafted into the military during the Vietnam War at the age of 22, serving 1959 to 1967. He said he didn’t mind going into the military and serving his country, thinking it was a great opportunity to receive a phenomenal education, but he was nervous because the attrition rate was high. After doing research, he decided to go into the engineering division of nuclear and diesel submarines. He would serve three months underwater at a time, with “about 130 men in 400 foot of tube.” Duffy was allowed to write 15 words on a note every 30 days, and that was it. Duffy said he did six-hour shifts, and the crew was on 18-hour days, never really knowing what time of day it was above them unless they went to the control room. Duffy said everyone who worked on the submarine, even the lead general, knew how to do each other’s jobs in case of emergencies. While on the submarine, Duffy said he had amazing food, at least before some of it went bad; was able to watch movies, play games and read books; and recorded whale sounds. Duffy said those who went into his program had to serve for six years. After serving, Duffy left the military. 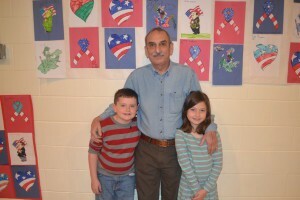 He married his wife Helen years after the war, and settled down in Shamong where their children went through all of the Shamong schools and now their grandchild, William Hall, is a fifth grader at Indian Mills Memorial School. Now 77, Duffy still works as a mechanical engineer.